Money in the Garage: You can get cold feet walking through a Dept 56 Christmas Village ! 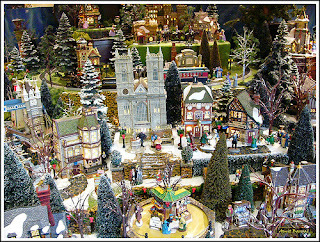 You can get cold feet walking through a Dept 56 Christmas Village ! Ah....the joy of eBay Christmas shoppers. They flock to your auction listings and eagerly enter multiple bids, driving up the prices of your items. It's all good...until they get cold feet later and plead with you to withdraw their bid! Bah humbug! A bidder can get cold feet in this village! This exact drama sadly played itself out between myself and a waffling eBay bidder a few days ago. Earlier in the week I noticed one of my Department 56 Christmas Village pieces I'd listed went from no bids to $70 dollars overnight! To my happy surprise, it was a piece that initially attracted little interest. I'd started the auction with an opening price of $30, guessing it might sell for around $40. But overnight the bidding action had taken off. I busted with pride the next morning when I discovered it was sitting pretty at $70 dollars! Awfully good, considering I only paid $10 dollars for the piece at a garage sale back in the September. But then, like a cold snowball thrown in my face, I received the below email from the top bidder. Appropriately, I'll call her "Debbie Downer." "I want to withdraw my bid. This is up to you. I will honor the bid if you do not agree. The person behind me is only trailing by $1.00. I will go along with what you say. Thanks." If you've ever received an e-mail from a bidder who asks to withdraw their bid, you know what a bummer it can be. Her request that I cancel her bid showed I was dealing with an eBay rookie. Debbie didn't seem to know a bidder can retract their own bids-they don't need a seller to do it for them. Making matters even worse, the auction only had one other bidder. By withdrawing Debbie Downer's bid, the price of my Dept 56 piece could potentially revert back to the opening auction price. It's sort of like playing Jenga-pull a block out from the bottom and the whole tower comes crashing down! What was doubly frustrating was trying to figure out why Debbie Downer bid so aggressively in the first place? She drove the price up-then changed her mind a few days later! What's up with that? Overall, the situation made me dream of a day when eBay would crack down on buyers for pulling these kind of stunts! But alas, I know that day is never going to come! "I am sorry, I am not sure what you are requesting? You want me to withdraw the bid that you entered?" Her response was a little more in depth, revealing that Debbie Downer apparently did not carefully read my auction description. But to her credit she admitted she made a mistake, explaining she bid thinking the piece was new. (Despite my clear description stating it was pre-owned.) Personally I think the piece could easily pass for new. However there are some extremely picky buyers who will find any little reason to criticize a piece-a tiny scuff, a mark on the ceramic, ect. If there's a minute flaw-they will try to find it! Pondering what to do, I initially thought about rejecting Debbie Downer's request. I was hoping another bidder would come in and outbid her at the last minute. By doing this, Debbie would've at least served as a useful tool in driving up the price of the piece. However, after thinking about the Christmas spirit and all that holiday goodwill stuff that my Mother hammered into me as a youngster, I decided to let Debbie Downer off the hook. So like a good boy, I cancelled her bid and guess what happened? As predicted, the bid price deflated like air from a kid's balloon, dropping from the once soaring price of $70 back down to an earthly $30 dollars! Bah Humbug again! But I guess Mom would tell me it was the right thing to do at Christmas time, so uggh....whatever! Ultimately it all works itself out and I'll console myself with other great holiday sales, some of which I'll be blogging about in the near future. How are your Christmas auctions going so far? Have you ever had a buyer get cold feet after placing a bid? If so, how'd you handle the situation? When I first started selling, a buyer wanted to back out because she had bid on three other bumbos and won one from someone else. Since I was a new seller, I was really irritated and let her know that you don't bid on three items just to back out on two others...a few weeks later she meesaged me that she should have stuck with mine because the one she bought had a big chunk out of it. I actually felt sorry for her. Now I'm a seasoned seller and now can let things just go without batting an eye. feetinwater- Ha! But even as a rookie you were right. Ball is in your court to ship ASAP. Arrrgh! I would have loved to write this rocket scientist back with a smart alecky reply. But I just bit my tongue knowing if I get on his wrong side there's absolutely nothing to stop him from filing negative feedback against me. So I ground my teeth and shipped out his jersey today...Arrgh! Oh well, you can't pick your buyers, right? My best non paying story is when we spent weeks putting together a vintage Pirate Ship Collection Lego Set. We set the price at $300 and got one buyer. A few days later we get the message that item needs to be cancelled by request of parents who are trying to track down their son who can't afford this item. Ha! The runaway son with their parents credit card! Classic! feetinwater-Ha! That's great. I've had a couple of those myself. Usually the bidder who just opened their account and has zero purchase or feedback is the dead giveaway! Good stuff! My sales before Christmas were ok, but not great. Lots of opening bid winners. Fortunately, I had adjusted my opening bid prices accordingly and wasn't too bummed with the winning bidders. However, right after Christmas, the normal bidding wars were back. I think I encountered this last year too. Seems everyone is spending on others before Christmas and then after Christmas, the collectables (typically purchased by the owner to be rather than being given as a gift) were being bought up for much higher prices. Very happy to be back to normal bidding routines. Sean-Good to hear your sales have kicked up after the holidays. I think folks start spending on themselves once they have Christmas in the rear view mirror. I like selling winter shirts & coats, ect. People need them this time of year. Thanks for sharing your holiday sales with us...Dude!